On June 14 the Polish Supreme Court ruled that no person has the right to deny service to a person belonging to the LGBT-community. The ruling came after a procedure that has been initiated by the Kampania Przeciw Homofobii (Campaign Against Homophobia), Poland’s biggest LGBT-organisation. A local print shop refused service to an LGBT-organisation. The organisation had notified the Ombudsman about the incident, who has passed it to the Police. In February 2016, the Police forwarded the case to the District Court. The Court found the employee guilty and punished him with a fine of 200 PLN (about €50). Minister of Justice Ziobro declared he didn’t agree with the ruling and initiated the procedure at the Supreme Court. According to KPH this is “a clear signal from the administration of justice that LGBT persons living in Poland deserve equal treatment and protection of their dignity no matter who they are and who they fall in love with”. Rémy Bonny had an exclusive interview with the lawyer of this “ground-breaking” case for LGBT-politics in Central and Eastern Europe Paweł Knut. Rémy Bonny: Does this open the door for a general anti-discrimination law protecting the rights of sexual minorities in Poland? Paweł Knut: I hope so. The problem that we are facing in Poland is that our anti-discrimination legislation is weak and not effective. The so-called Equal Treatment Act covers the area of access to goods and services. However, it does not include sexual orientation as a protected characteristic in this field. That is why we had to find alternative legal provisions that could help us to eliminate legal limbo for gays and lesbians. Eventually, we decided to use art. 138 of the Code of Misdemeanours that prohibits unjustified refusal to provide goods and services. We argued – and the Supreme Court confirmed that we were right – that the discriminatory motivation couldn’t serve as a justified reason for refusal. This Supreme Court’s judgement confirms that we have a protection in Polish legal framework against these forms of discrimination. I hope that this progressive decision will foster the public debate and lead to the adoption of necessary amendments to the Equal Treatment Act. However, to achieve this we will also need a political will. I am afraid that at this point the current decision makers are not interested in strengthening the protection of the LGBT people living in Poland. To some extent we can provide this protection by the precedent judgements, like the one in the so-called printer’s case. However, this “precedent-judgement strategy” can help to solve some manifestations of the problem, but not the problem itself. There is and there will be a discussion about it. But I’m not sure if this wel lead to legal changes. Did you expect this ruling? Yes, I did. I knew I had made a very strong case. And all the judges agreed with that. During the legal proceedings 4 sentences were ruled by courts of various degrees of jurisdiction. Each and every time the printer was found guilty. Rémy Bonny: What has been the political reaction towards the ruling in Poland? Paweł Knut: Yesterday, immediately after the publication of the judgement, Prosecutor General Zbigniew Ziobro held a press conference. He strongly criticized Supreme Court’s decision, stating that this was an example of the “state violence”. He declared that he will fight this judgement in the Constitutional Tribunal. If he will not succeed, he promised that he will try to remove the art. 138 from the Code of Misdemeanours. Ziobro: “As long as I will be prosecutor general I will protect the freedoms of the people in Poland”. He decided to fight the ruling at the Constitutional Tribunal. Since the reforms of the constitutional tribunal of last year, the judges there are not independent anymore. So we are afraid that the Prosecutor-General will use his power in the Constitutional Tribunal to fight this ruling. If we loose the proceeding at the Constitutional Tribunal we will have to start over with the proceeding at the Supreme Court. But the Polish government’s attack on the rule of law also made the Supreme Court less independent. This changes start next month, so I hope we won’t have to start over. Rémy Bonny: Is Poland ready for more equality for the LGBT-movement? Paweł Knut: Yes. I’m sure that over 50% of the Polish socie ty wants legal protection for LGBT-citizens. The LGBT-movements gets more and more acceptance by the Polish people every year. 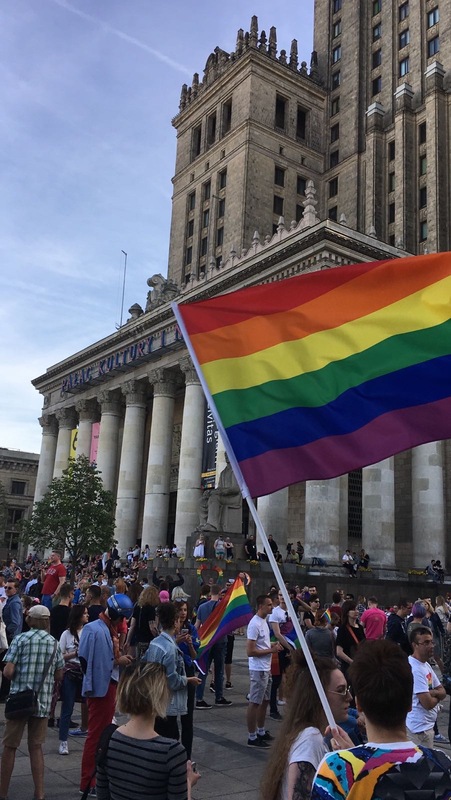 Tens of thousands of people marched last weekend during the Equality Parade in Warsaw.